As much of Black America enters a new era of political and social consciousness, no bastion of white supremacy is safe, including that which paints the Rev. Dr. Martin Luther King, Jr. as a passive integrationist and unwavering friend of the establishment. Amid celebrations of what would’ve been the storied Civil Rights figure’s 85th birthday, people of African descent focused less on the King of 1965 who asked us to dream and more on the man who called for cooperative economics and mass boycotts of discriminatory corporations that didn’t hire African Americans. This recent shift in thinking among many black people reflects a collective yearning to effectively combat modern-day racism. Such a mindset guided what turned out to be an engaging and thought-provoking discussion at the Thurgood Marshall Center for Social Justice, located in the heart of the Shaw neighborhood. 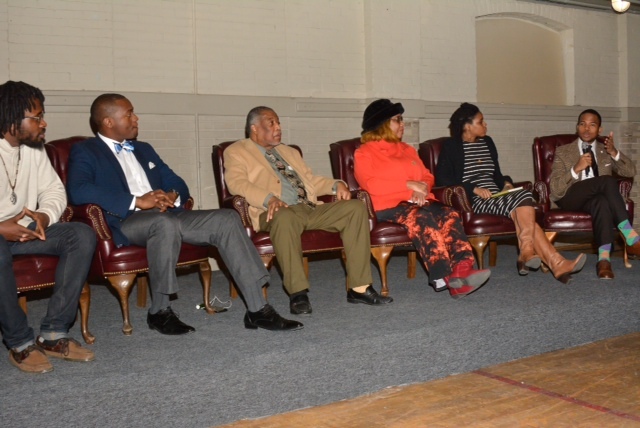 More than a week before the 2016 King Holiday, more than 70 people of the various ages, professional backgrounds, and industries gathered in the gymnasium of the historic building and listened as three panelists weighed in on the issues of the day and laid out a blueprint they said would guarantee true systemic change benefitting African Americans. The “Martin Luther King: Continuing the Struggle for Justice” panel discussion, sponsored by the Thurgood Marshall Center Trust, opened with a keynote address from Dr. Ben Chavis, president and CEO of the National Newspaper Publishers Association. Chavis, a Civil Rights figure himself, recounted his personal experiences with King, reminding audience members that one didn’t – and still doesn’t – require a proper title or credentials to take part in the revolution. Such a mantra by Chavis counted as a perfect segue to nearly two hours of vibrant discourse about how black people can support each other in the contemporary Civil Rights movement. Big Baba Rob of the Black Geeks, a popular online radio program, Levar Jones, senior staff member of the Boys & Girls Club of Greater Washington, and Nataki Kambon, an organizer in the Lets Buy Black 365 movement took on the daunting task of coming up with solutions. The trio, under the guidance of Sam P.K. Collins, moderator and host of grassroots media outlet AllEyesOnDC, touched on the power of a holistic political education, the circulation of black dollars within the black community, and addressing the shortcomings of our current leadership in black communities across the country. Throughout much of the evening on Jan.7, Kambon repeatedly mentioned King’s “Message from the Mountaintop,” stressing that the late Civil Rights leader adopted a philosophy of self-reliance that the black community should emulate in today’s freedom struggle. To her, that meant less marching and yelling, and focusing more on redirecting more than $1.3 trillion in annual spending by black people to black-owned businesses and institutions. Big Baba Rob supported that notion, encouraging the audience to practice unity as the recently deceased Dr. Frances Cress Welsing mandated in her popular lectures. With a group of his students in the front rows looking up at him, Jones extolled the efforts of youth on the front lines, raising awareness in their communities and doing their best to combat institutional racism. Echoing Chavis’ previous statement, Jones reminded audience members that black people, especially those in underclass, have to feel empowered so that they understand they play an important part in their community. Days later, his students would celebrate the one-year anniversary of their #OurLivesMatter campaign, a burgeoning movement that focuses on youth engagement and grassroots organizing. All in all, the audience enjoyed an action-packed discussion and walked away inspired to go into their communities to carry on the behind-the-scenes work that Dr. King wanted to complete in the days before his assassination.